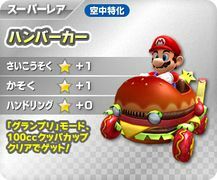 The Hamburcar is a kart found in Mario Kart Arcade GP DX. Its name is derived from its appearance as it is shaped and designed of a Hamburger, while the wheels are meat patties. Its alternate colors are dark brown and beige.